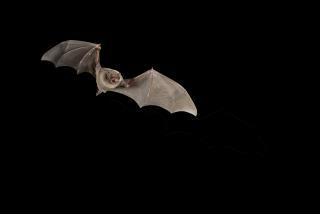 (Newser) – Gary Giles and his wife, Juanita, would often use their hands to catch the bats that would end up flying around inside their home in Moroni, Utah, and they never had any issues. "The bats would lick our fingers, almost like they could taste the saltiness of our fingers, but they never bit us," Juanita Giles tells KSL. But things started going south with Gary Giles' health in mid-October, when he first started experiencing neck and back pain, and he headed to the ER on Oct. 19. He was treated and sent home with meds, but soon he was wheezing and feeling numbness and tingling, and he was rushed by ambulance to the ER. He died at the age of 55 Sunday, surrounded by his family, and doctors say the cause of death was rabies, likely from the bats. It's Utah's first death from rabies in almost 75 years. "They had no idea of the risks"? As the old saying goes, "stupid hurts" and in some cases, it's deadly. i thought the photo was Nancy "Bela" Pelosi, out looking for the gavel.